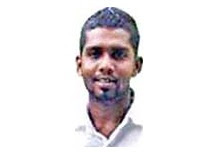 K.Chathuranga alias Battaramulle Bunty, a key suspect in last month’s attack on a prison bus, has told the STF officers who captured him, that the killers had prior information that the underworld leader ‘Samayan’ and four of his cohorts would be transported to Kaduwela courts. Later the suspect was handed over to the Colombo Crime Division. The suspect told his interrogators the mastermind of the attack was an underworld figure named ‘Angoda Lokka’. ‘Bunty’ said ‘Lokka’ had handpicked ten of fellow criminals for the attack and they had been dressed in uniforms worn by police and prison officers. The bus was obstructed with a stolen double cab parked across the road close to the prison and the attackers boarded the bus and started firing at their targets indiscriminately killing five underworld figures and two prison officers on the spot. "After killing them we fled in a getaway van and disembarked at different locations." he said, adding that he had got off in Panadura. The weapons used in the attack had been removed in a different vehicle, he told the STF.